The American Farm Bureau Federation’s 33rd annual survey of classic items found on the Thanksgiving Day dinner table indicates the average cost of this year’s feast for 10 is $48.90, or less than $5.00 per person. This is a 22-cent decrease from last year’s average of $49.12. 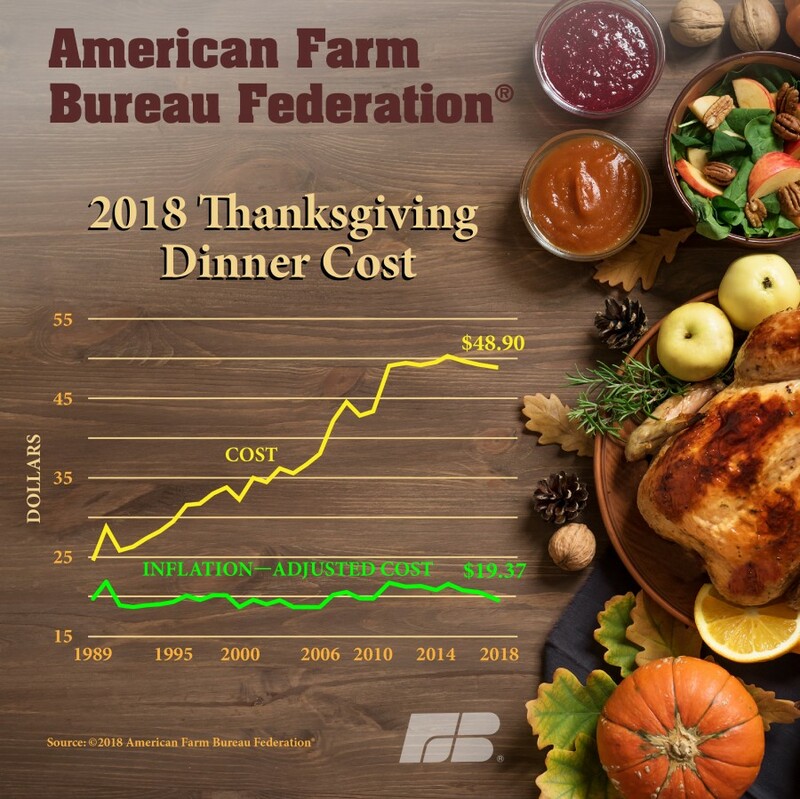 “Since 2015, the average cost of Thanksgiving dinner has declined steadily and is now at the lowest level since 2010,” said AFBF Chief Economist Dr. John Newton. The featured food on most Thanksgiving tables – the turkey – cost slightly less than last year, coming in at $21.71 for a 16-pound bird. That’s roughly $1.36 per pound, down 3 percent from last year. The survey results show that retail turkey prices are the lowest since 2014. “Thanks to an ample supply, turkey remains affordable for consumers, which helps keep the overall cost of the dinner reasonably priced as well,” Newton said. 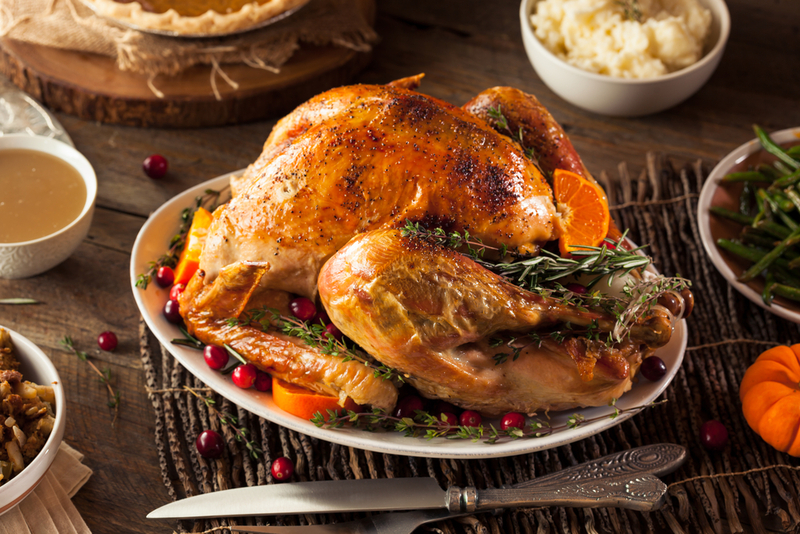 The shopping list for Farm Bureau’s informal survey includes turkey, stuffing, sweet potatoes, rolls with butter, peas, cranberries, a veggie tray, pumpkin pie with whipped cream, and coffee and milk, all in quantities sufficient to serve a family of 10 with plenty for leftovers. Foods showing the largest decreases this year in addition to turkey were a gallon of milk, $2.92; a 3-pound bag of sweet potatoes, $3.39; a 1-pound bag of green peas, $1.47; and a dozen rolls, $2.25. Several items saw modest price increases this year including cranberries, pumpkin pie mix and stuffing. A 12-ounce bag of fresh cranberries was $2.65; a 30-ounce can of pumpkin pie mix was $3.33; a 14-ounce package of cubed bread stuffing was $2.87; two nine-inch pie shells came in at $2.47 and a 1-pound veggie tray was $.75. A group of miscellaneous items including coffee and ingredients necessary to prepare the meal (butter, evaporated milk, onions, eggs, sugar and flour) was also up slightly, to $3.01. There was no change in price for a half-pint of whipping cream at $2.08. The stable average price reported this year by Farm Bureau for a classic Thanksgiving dinner tracks with the government’s Consumer Price Index for food eaten at home. But while the most recent CPI report for food at home shows a 0.1 percent increase over the past year (available online at https://www.bls.gov/news.release/cpi.nr0.htm) the Farm Bureau survey shows a decline of less than 1 percent. After adjusting for inflation, the cost of this year’s Thanksgiving dinner is $19.37, the most affordable in more than a decade. New this year, to capture the diversity in Thanksgiving meals across the U.S., American Farm Bureau also checked prices on a 4-pound bone-in ham, 5 pounds of Russet potatoes and 1-pound of frozen green beans. “Adding these foods to the classic Thanksgiving menu increased the overall cost slightly, to $61.72 or about $6 per person,” said Newton. A total of 166 volunteer shoppers checked prices at grocery stores in 37 states for this year’s survey. Farm Bureau volunteer shoppers are asked to look for the best possible prices, without taking advantage of special promotional coupons or purchase deals, such as spending $50 and receiving a free turkey. Shoppers with an eye for bargains in all areas of the country should be able to purchase individual menu items at prices comparable to the Farm Bureau survey averages. 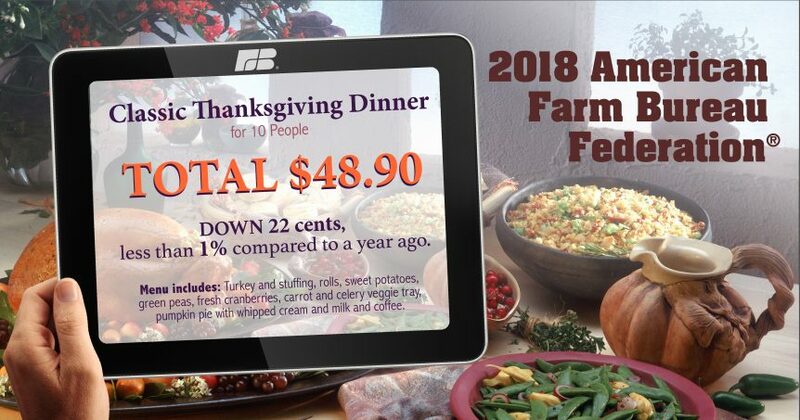 Farm Bureau also surveyed the price of a traditional Thanksgiving meal available from popular food delivery services. This revealed that the convenience of food delivery does have a larger price tag. A 16-pound turkey was nearly 50 percent more expensive at nearly $2 per pound when purchased from a food delivery service. Nearly every individual item was more expensive compared to the Farm Bureau average and the total cost of the dinner was about 60 percent higher at about $8 per person. The AFBF Thanksgiving dinner survey was first conducted in 1986. While Farm Bureau does not make any scientific claims about the data, it is an informal gauge of price trends around the nation. Farm Bureau’s survey menu has remained unchanged since 1986 to allow for consistent price comparisons.